Air Active™ Nose Pads are made of super-soft, super-flexible pure silicone for an ultra-soft, allergy-free solution to nose pad related comfort complaints. These hollow nose pads will float your glasses on a cushion of air, for unbelievable comfort. Air Active Nose Pads are available in screw-on style 11mm (7/16\"), 14.5mm (9/16\") and 17mm (5/8\") or push-on style in 13mm (1/2\"). The shape is symmetrical, so the pads fit on either the left or the right. Available in packs of 5 pair, or the large economy size of 100 pair at a substantial discount. Your clients deserve the best. Install these on their new eyeglasses and see how many fewer comfort complaints you get. Why silicone Air Active nose pads? Silicone is the top material choice for comfortable nose pads. When it comes to the best material to touch sensitive noses, silicone consistently comes out on top over hard acetates, polycarbonates, hard plastics or metals. In the last few years a new trend has developed that many dispensing opticians are very happy to see. 80% of patient complaints are comfort related. Air Active nose pads are the most comfortable nose pads on the market today, eliminating almost all nose pad complaints. Air Active silicone nose pads are easy to clean. Air Active nose pads warm to the touch quickly. Air Active silicone is safe. Few people have silicone allergies and there are no phthalates in silicone. Phthalates are chemicals in rubber and plastic that make them pliable and soft. Air Active nose pads do not have a funny smell like plastic nose pads have. 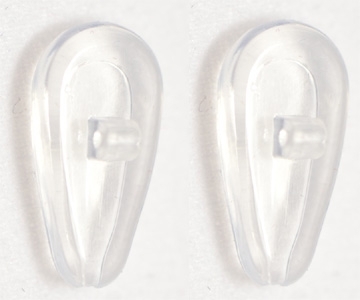 Air Active nose pads are easy to install on all eyeglasses that use nose pads. Makes even $10 \"readers\" feel like a million! Air Active nose pads won\'t harden or discolor over the years as some plastic nose pads do. Try Air Active nose pads today. Your clients will thank you. Besides Air Active products, QTE offers hundreds of nose pads in various shapes, sizes, adjustability and materials, including many hard to find types. This ensures that virtually everyone can meet their particular nose pad needs. To find your preference in eyeglass nose pads, just browse QTE\'s website at www.qtena.com. Please email any questions to info@qtena.com, or if you prefer, call toll free number at (877) 481-5115, or (909) 481-5115 for calls outside the US. \"You and your clients will love Air Active super-soft nose pads. I guarantee it.\"